Life in the Fast Lane! Live fast, drive hard, and leave the burning wreckage of your foes in your rearview mirror! The world of Car Wars comes to GURPS with GURPS Autoduel. In this supplement, you'll find detailed vehicle design rules, an assortment of ready-to-use vehicles, and guidelines for making Car Wars characters. Bring the world to life with the timeline of future history and mini-atlas of North America, and keep the action moving with the pull-out section of handy charts, tables, maps, and even an adventure! 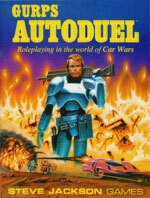 GURPS Autoduel (Second Edition) – The revised version of this supplement from 1996. 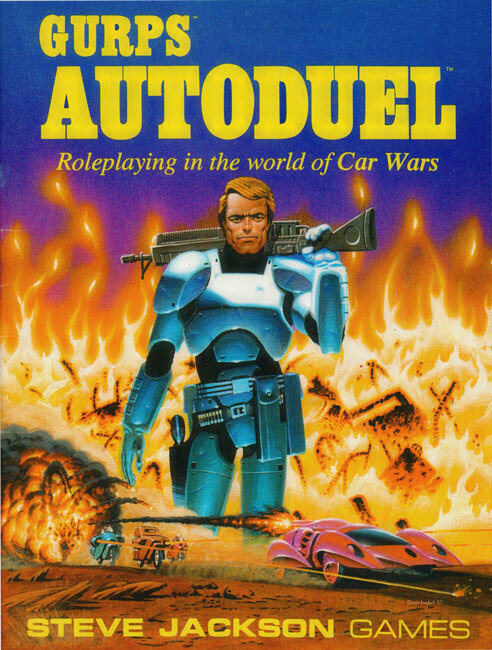 GURPS Autoduel: Car Warriors – 36 pre-generated duellists, MONDOs, troopers, bikers, and dregs.